Liz Ranney is a contemporary painter, digital media artist, illustrator, and instructor. She infuses her artwork with bright and bold color and explores ideas of expression, connection, and fragmentation. 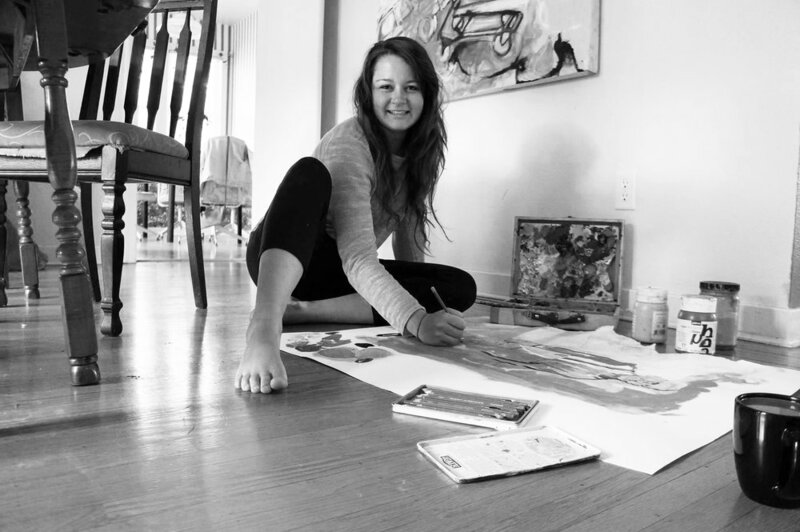 She graduated with a Bachelor in Fine Arts in 2012 from UBC Okanagan, and works primarily as a portrait artist, combining mixed media with traditional techniques and contemporary imagery. Ranney currently instructs art classes and workshops at the Kelowna Art Gallery, and has taught at the Rotary Centre for the Arts, CMHA, and heARTschool Kelowna. Some of Liz Ranney’s most recent projects include a solo painting exhibition in Toronto, ON. (Jane Roos Gallery), large scale murals in the Okanagan in collaboration with her husband Dylan Ranney (Ranney Creative), and artworks commissioned for local companies, writers, and musicians. I had the privilege to have a conservation with this lovely lady, who is super talented, passionate, kind to name a few. Continue reading below as I asked Liz a variety of questions from how she deals with negative talk, advice for other business women, how to juggles work life etc.. .
Have you ever had to deal with critics saying negative things about your career adventures? If so how did you deal with the lack of support in your career or negative talk? I have never had anyone discourage me from continuing to grow in my career as an artist. Looking back, there has only been one time when I encountered negativity concerning my career choice, and it was following my graduation from UBCO. I was talking with someone at a social event, and this person asked me what I had studied. I have heard this question a lot more than I was expecting, and I am finding that most people are not aware of just how many careers are possible with a degree in the arts. I have heard my degree talked about as “the easiest degree”, the “useless” degree. However, the support that I have received far outweighs any negative talk that I have encountered. I am fortunate in having an extremely supportive husband and family, and a group of amazing friends who encourage me to continue living my dream. What is the biggest mindset shift you had to overcome as an artist so far? My biggest mindset shift so far, has been to push forward and make Art a full-time career. It is a very scary thing to make the leap, but I am finding that the transition has been met with a lot of opportunity. How do you juggle being a mom, wife, and a career woman? Do you have a secret to share with other women? Life is hard. There is no perfect formula for being a mom, wife, and career woman! I’ve realized that I set a very high bar for myself, and I tend to take on more than I can handle, and this makes me unnecessarily stressed and unavailable to my family. If I can give any sort of advice in this department, it would be to leave your work at work, and make time for intentional family togetherness. What is the best piece of real vulnerable advice you have ever received from a friend or someone you admire? The best piece of advice I have ever received is “It’s okay to say no.” It is better to decline a commission or request when you have competitive deadlines because you will compromise the quality of other projects to accommodate the new project. It is better to say “no” than to take on more than you can handle, and deliver product that is less than your best. What keeps you motivated to wake up every single day, shower ( it's okay if you don't shower everyday, I sometimes forget :P ) and do life? My family! I am motivated to provide for my family, be a good role model for my daughter, and continue to work hard to pursue my dream career as an artist. If you could share a message to a room full of women, what would you say? If I could share a message to a room full of women, I would say that nothing should stand in the way of your dreams; not the adversity of gender discrimination, the supposition that you have to choose between being a family woman or a working woman, or the burdens and hardships that come with daily life. All dreams can be achieved, and when they might seem unreachable or impossible, perseverance and a reminder of the big picture are necessary. At the end of a long day, what is your favorite thing to do? At the end of a long day, I like to have dinner with my family, and spend some quality time together playing games or watching a movie.